Inkay in game: 8,431 Who? Important notice! Pokemon Inkay is a fictional character of humans. Inkay (Japanese: ?—?—? Maaiika) is a dual-type Dark/Psychic Pokémon introduced in Generation VI. 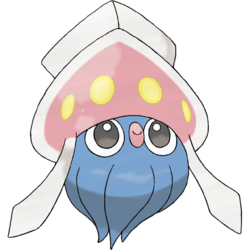 Inkay is a primarily blue squid-like Pokémon. 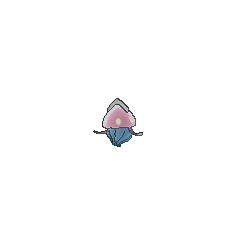 It has a transparent mantle that resembles a hat with a pink "inner body" overlaid with yellow lights. Those who stare at those lights become dazed and lose their will to battle, allowing Inkay to escape. It has two tendril-like tentacles that hang from this "hat", similar to some styles of winter hats, and these tentacles hang next to its six short arms. Its eyes are round and have pupils, but no identifiable iris. Inkay also has a small, pink, beak-like mouth set between its eyes. 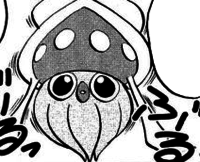 It and its evolution, Malamar are the only known Pokémon capable of learning Topsy-Turvy. 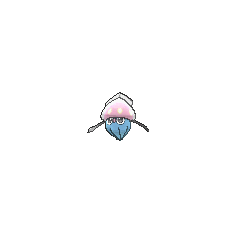 An Inkay appeared in A Battle of Aerial Mobility!, which James caught while he was eating sandwiches. Multiple wild Inkay appeared in Facing the Grand Design!, where James's Inkay helped save them, as well as some good Malamar, from the evil Malamar. Inkay debuted in Kangaskhan...Kangascan't, where it was seen with its trainer, a male Poké Fan. Xerosic's Malamar was revealed to have been under his ownership since it was an Inkay. It evolved when Lysandre explained him it's peculiar evolution method, demonstrating it by turning Inkay upside-down, making it evolve instantly. 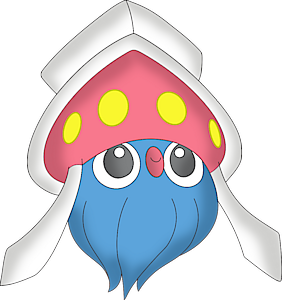 Inkay appears as a Poké Ball summon in both versions of the game. It will turn over and hit the ground, making all opponents who are on the ground trip. They are the only Pokémon in the Water 2 Egg Group that are not Water-type. They are the only Pokémon that can have the ability Contrary without it being their Hidden Ability. 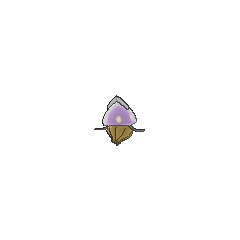 Inkay is the shortest Dark-type Pokémon. Maaiika may be a combination of ? ma (demon) and ?? ika (cuttlefish or squid) or ??? maika (Japanese flying squid). It may also involve a pun of ??,??? Ma, iika (Well, whatever; Oh well).